The final company featured in our Birthday Bash event this year is one of the most helpful sites out there for planning birthday parties! Birthday Party Kidz was created to make it easy for you to find the hundreds of birthday party supplies and to create a "Wow" birthday party! They have wonderful, innovative party ideas, personalized invitations and tableware, new party themes, fun party favors, party games, printable games, and lots more! I got so many ideas and products of their site and I love all the theme ideas they offer - that is the part I always have the most trouble with when my children's birthdays roll around each year. Well, Birthday Party Kidz partners with the web's best party supplies stores so that you can compare their party supplies "side-by-side" and place your order on the website of your choice! No pressure, no selling - just you picking out the products and prices that fit your budget and party! Browse through the pages of Birthday Party Kids to find party supplies for kids of all ages, then simply click to go directly to the website of your choice. Come back to their site often to see what's new and take advantage of their exclusive offers and coupons. 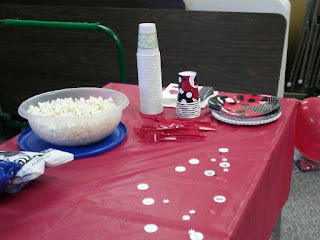 This year, we planned a 1st Birthday Ladybug Party and Birthday Party Kidz had such a great Ladybug party ideas and pointed me directly to all the sites that offered them! I settled on the Ladybug Fancy Kit and the Highchair Kit because it contained all I needed to decorate and supply my party! Plus, they were so cute! 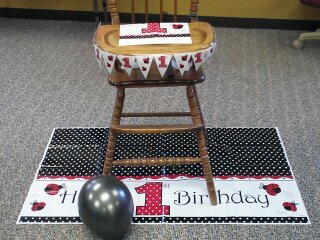 I also really love the Highchair Kit because it helps decorate a plain old high chair and transform it into a birthday throne! 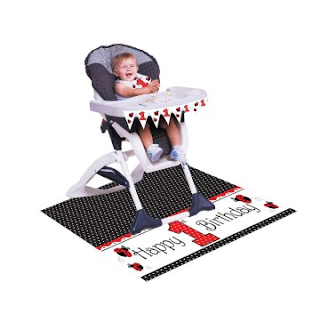 The LadyBug Fancy High Chair Decorating Kit includes (1) 31" mini flag banner, (1) 48" x 30" floor mat and (1) 12" x 12.5" bib. It added just the perfect touch to her party! So next time you are starting to plan your child's birthday party and are stumped where to start or what theme to use, head to Birthday Party Kidz and find all kinds of theme ideas, products and compare sites for all the best prices and products! Their site is really helpful and you will never plan a party without it again!